• Accommodation: either in 5star, 4star or 3star Hotels/Lodges depending on your budget. • Flight Option: Flying option is available for this safari but at an extra cost. • Early booking is advised to avoid missing on your choice of hotels/accommodation. Day 1: Arrive in Arusha and depart to Lake Manyara. You shall be met by our driver guide on arrival at Namanga Border at 1000hrs and transfer to town restaurant for lunch. After lunch depart to Lake Manyara. Arrives at the lodge for evening at leisure and hot dinner.Dinner and overnight at Lake Manyara Hotel – Full Board. After breakfast, enter Lake Manyara National park for the morning game drives. Lunch at the Lodge. After lunch depart to Serengeti national park with game drives en route. Arrives at the lodge for evening at leisure and hot dinner.Dinner and Overnight at Seronera Wildlife Lodge – Full Board. After breakfast proceed with full day game drives in the Serengeti National Park. Meals and overnight at the lodge.Dinner and Overnight at Seronera Wildlife Lodge – Full Board. Day 4: Serengeti National Park to Ngorongoro Conservation area. After breakfast, proceed with final game drives in Serengeti national park. Later on depart to Ngorongoro conservation area via Olduvai Gorge, arrives at the lodge for evening at leisure and hot dinner. Dinner and Overnight at Ngorongoro Wildlife Lodge – Full board. Day 5: Full Day in Ngorongoro Conservation area. After breakfast, descend down the crater floor for the full day game drives with picnic lunch box. Later in the evening ascend the crater rim and return to the lodge for evening at leisure and hot dinner.Dinner and Overnight at Ngorongoro Wildlife Lodge – Full board. Day 6: Ngorongoro Conservation area – Arusha – Zanzibar. Full day of leisure in the hotel. Transfer to the airport to catch flight back home. • City Tour:-See the wonders of Stone Town, sample the local fruits and spices visit the Sultans Palace full of artifacts and historical objects, The Arab Fort and walk through the meandering narrow streets of Stone Town. Also visit Dr. Livingstone’s house, the house of wonders and the Zanzibar museum, which holds interesting relics from the past. • Spice Tour:-Zanzibar is known as a spice island. Visit to the Persian baths built in 1850 by Seyyid bin Sultan and the spice plantations at Kizimbani. • Dolphin Tour:- Visit the fishing village of kizimkazi. It is here that we find the first evidence of Islam in East Africa. Visit the old mosque built in 1804 and board a local dhow or boat to see the dolphins and swim with the dolphins. • Prison Island Tour:-Formally used by the Arabs as a confinement for refractory slaves, the island is also home to the giant tortoises besides a hot spot for snorkeling and sunbathing. The best game viewing areas on the continent of Africa is a highly debated topic, but Tanzania with its attractions including Serengeti, wildebeest migration, Ngorongoro Crater, Olduvai Gorge, Mount Kilimanjaro and Zanzibar Beaches, is one obvious contender. Tanzania is a fascinating travel destination that has been blessed with real beauty and it offers something for everyone. Mt Kilimanjaro, with its 5895 metre altitude is the highest mountain in Africa. The Serengeti National Park with its seemingly endless plains, is one of the best wildlife resorts in the world and then there is the Ngorongoro Crater with its unbelievable density of animals. It is also the site of Olduvai Gorge, where Professor Leakey discovered the earliest known footprints of hominoid man. 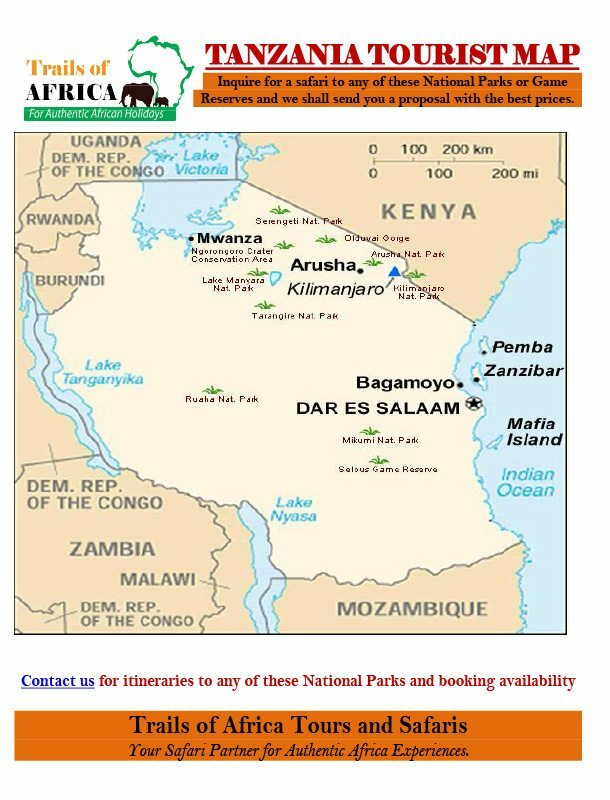 The “Northern Circuit” includes Arusha National Park, Tarangire National Park, Lake Manyara National Park, Ngorongoro Conservation Area, Oldupai Gorge and the Serengeti National Park. The northern parks, are justifiably world-renowned, especially if you are there to witness the enormous herds of the Great Migration or to take a balloon or riding safari across the vast grassy plains. The escarpment of the Great Rift Valley creates a dramatic volcanic landscape and some of the most fertile grazing grounds on earth; thus this is home to the largest herds on the planet, and the highest concentration of predators in the whole of Africa.